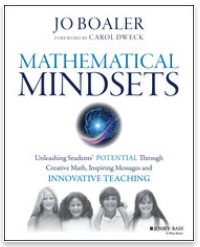 Mathematical Mindsets is all the rage these days primarily due first to the work of Carol Dweck who introduced the idea in Mindset: The New Psychology for Success and now Jo Boaler who turned it into its current name. I considered myself good at math initially back in the 2nd grade because my mom praised me for doing well in arithmetic (getting an A on my report card). But I didn’t believe I was a math genius because of my habit of making too many “silly” mistakes in regurgitating what the teacher was teaching us. Other students got higher scores than I did, but I managed to hold my own with a B+ average. Then one day in the 4th grade my teacher challenged us with a question referring to baseball. “How do you determine a pitcher’s earned run average (ERA) in baseball?” she asked. No hands went up except mine. Being an avid baseball fan and having collected and analyzed all the players bubblegum cards, I had memorized the formula for finding that statistic. The teacher was very impressed. But then she asked me “How did you figure out that formula? “I didn’t,” I said. “I saw it in a book about baseball.” She was disappointed, but so was I. So I went to the library, found the book and this time I read the explanation. It took me a while to understand it, but I managed and then excitedly shared what I learned with my teacher. "That’s great," she said, "but next time don’t just memorize the formula, understand it." Given my passion for baseball that was not a problem for me anymore. I never forgot that advice for the rest of my life. It’s no good knowing anything of interest without understanding it deeply. From then on I was a “math person*” which in Jo Boaler’s terminology meant I had a mathematical mindset. As a math teacher I tried to get many students who were set in their ways about disliking math to want to appreciate the power of math. They did while they were in my class. 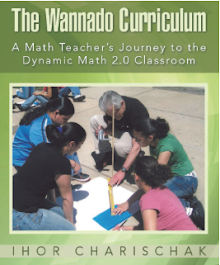 But once they left and went back to doing math the old way, they stumbled back into their “fixed” mindsets about math. So why did a significant event in my life change my mindset in a positive way, while my students who clearly enjoyed my class did not have the same transformation? 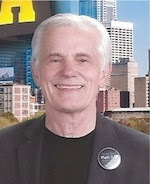 One thing that helped was that I had good feedback about my math “ability” as early as the 2nd grade. So good experiences are needed right from the beginning of learning math. I have a 5 year old grand nephew who can count (proudly so) to a hundred. His father is a born again math person who struggled most of his life with an aversion to math. He became math savvy while he was employed as a car salesman. I look forward to my grand nephew having a mathematical mindset throughout his school career. The activities that Jo Boaler shares in her book are all good ways to develop a mindset that will hopefully continue to grow throughout a student’s school years. *To me a "math person" is someone who has a mathematical mindset, works in a field that requires math in problem solving and is proud of it.